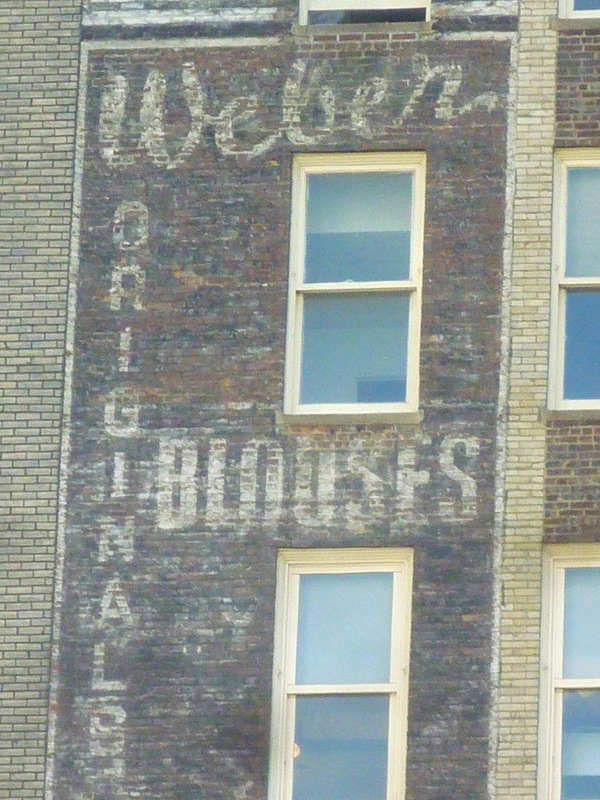 The Faded Ad Wall on West 36th: Alco Blouse Co. 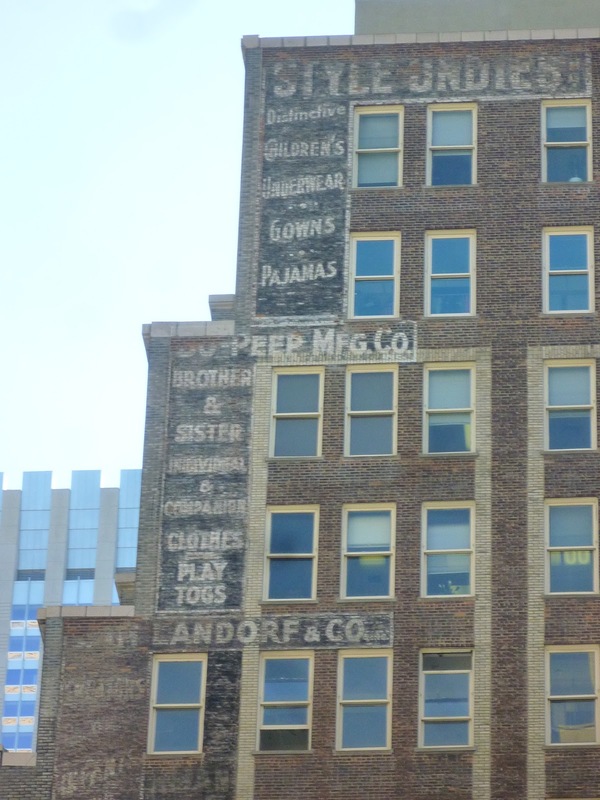 This is my third investigation into the histories behind the puzzlework of faded, painted ads on the west side of the mid-sized brick tower that is 64-70 W. 36th Street. Alco Blouse Co. moved into this building in 1938 and moved out around 1950. (All the businesses featured in these ads seemed to have been residents between the mid-'30s and mid-'60s.) Alco was, tantalizingly, "manufacturers of cotton and silk popular blouses." Popular! Maybe they were popular because, unlike other garment makers in this building, they made things out of natural fabrics. No rayon for Alco! I've found out who ran Alco. It was Sy H. Corak and Albert Corak. I know this because they took out an obituary in 1948 in the New York Times mourning their "beloved friend associate" Paul Henry Klein. This also gives us the key to the name. Albert Corak = Alco. Albert liked to take out space in the Times. Albert's son Howard got engaged in 1952, and the happy occasion was featured in the broadsheet. The day before that announcement came out, Corak got in the paper for a different reason, when the police were reported to have caught a notorious cat burglar at Corak's Great Neck home. As for Sy, in 1953 it was reported that he was developing 103 homes on Long Meadow, L.I., to be part of a housing development called Broadlawn Estates. I guess Sy made a lot of money while Alco was on W. 36th. The Faded Ad Wall on West 36th: J.D. Sachs Co. This is post two in my search for the histories behind the faded ads that paper the west side wall of 70 W. 36th Street. J.D. Sachs is the third painted ad from the bottom of the wall. The name is still fairly visible from the street. Less legible are the smaller messages "Infants & Children's Sportswear," and "Sizes 1 to 14." The Sachs company occupied this building from 1946 to 1960. In 1960, Sachs came up with a new skirt for girls called the "Adjust-a-Pleat." The skirt had "an adjustable band threaded with a thonged belt to allow for snug fit regardless of waist size." They were drip dry and needed no ironing, and were made of "acrilan" and rayon. You could buy than at Ohrbach's on Union Square. I don't know what happened to the company. But in the late '70s and early '80s, you start reading about a J.D. Sachs based in Pennsylvania. Only they don't sell children's clothing. They sell mountain and outdoor gear. Perhaps the company transitioned into a new line and moved out of New York. La Traviata, a mainstay of Brooklyn Heights' Montague Street shopping strip for 34 years, has closed. Apparently, it shuttered last November, but I only just noticed. They lost their lease. Montague has become notorious in recent years for unrealistic rents and high business turnover. The landlords, greedy and short-sighted, never seem to learn. The space will reopen as a new eatery. Lat Traviata was the subject of a May 2010 "Who Goes There?" column. Ralph Tommaso was the owner of the not-special but comforting restaurant. By some miracle, a entire building wall of faded ads at 70 W. 36 Street between Sixth and Fifth Avenues has survived. There are more than a half dozen, positioned like building blocks, one on top of another, along the edge of a building just to the left of Keens Chop House. 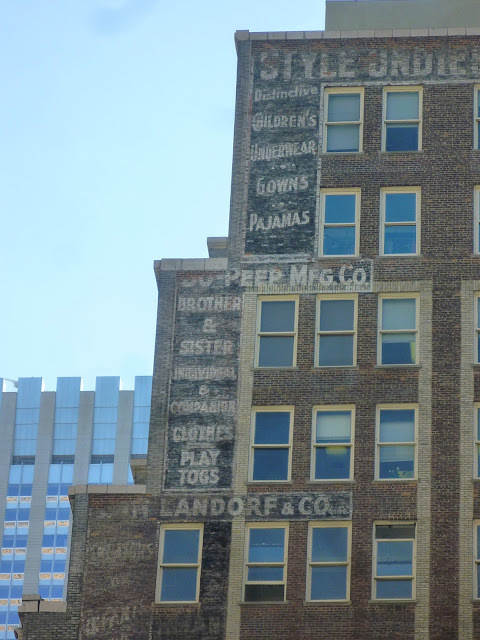 Most advertise once thriving garment companies in the area, now all vanished. I've looked at these ads many a time. The other day, while gazing up on them again, and feeling thankful that they were still there, I was gripped by a desire to know more about the companies whose names were painted on the brick. So I've decided to decode each ad, one by one. I'll start with one of the simplest and most clearly readable from the street. Weber Original Blouses. I like how each of the three words has a different font and a different personality. You'll see Weber blouses advertised by vintage clothing shops on the Internet today. The company was only at this address from 1948 to 1959, after which they moved to Seventh Avenue. So I'm guessing that's when the ad dates from. 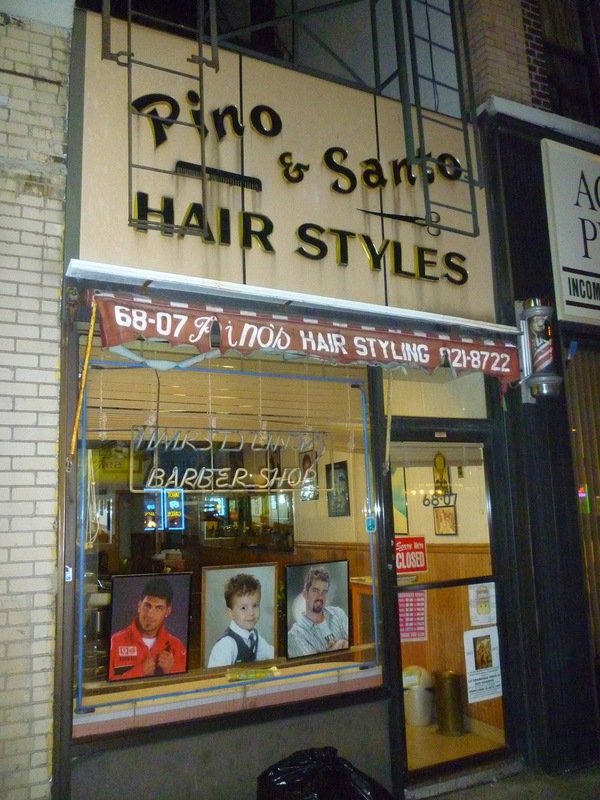 The business survived until the 1970s. The outfit seems to have dealt in the then-popular man-made fabrics of nylon and dacron. Who founded it, I could not discover. I guess people don't really care that much about recording for posterity who created some little blouse company in Manhattan in the mid-20th century. 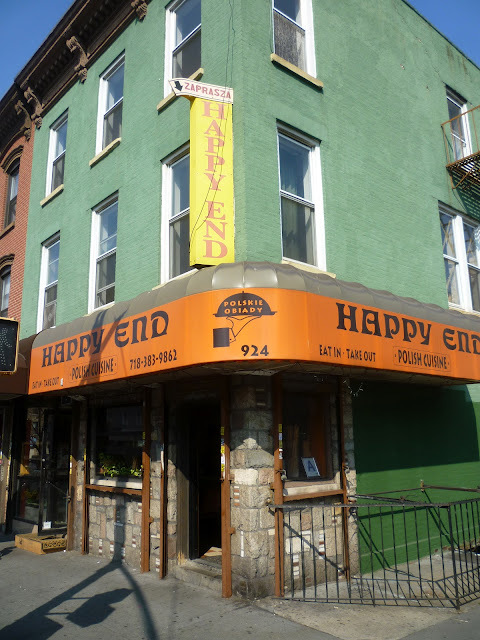 The Happy End Diner of Greenpoint looks older than its 20 years. The wonderful semi-circular counter and stools inside, in particular, make you want to tack an extra 20 years onto its age. It surely must have contained a different diner previous to the arrival of Happy End. This is a Polish eatery in every way. The food is Polish, the menu is in Polish (there's an English version), the talk is in Polish. But the welcome is friendly. There's nothing on the bill of fare that's over $10. Tripe soup, borscht, pierogis, stuffed cabbage, kielbasa, blintzes, pig's knuckles and, my favorite, Hungarian potato pancake (it's stuffed with beef goulash). In the back, there's an additional room with a few no-frills tables. I feel you could play cards back there for hours and no one would give you the bum's rush. Heavily Polish Greenpoint is where you would find a funeral parlor named Mizgalski. On Java Street, off Manhattan Avenue, was were the mortuary sat. It seems to have closed fairly recently. The property is advertised as for sale. The handpainted name on the metal awning is touching. 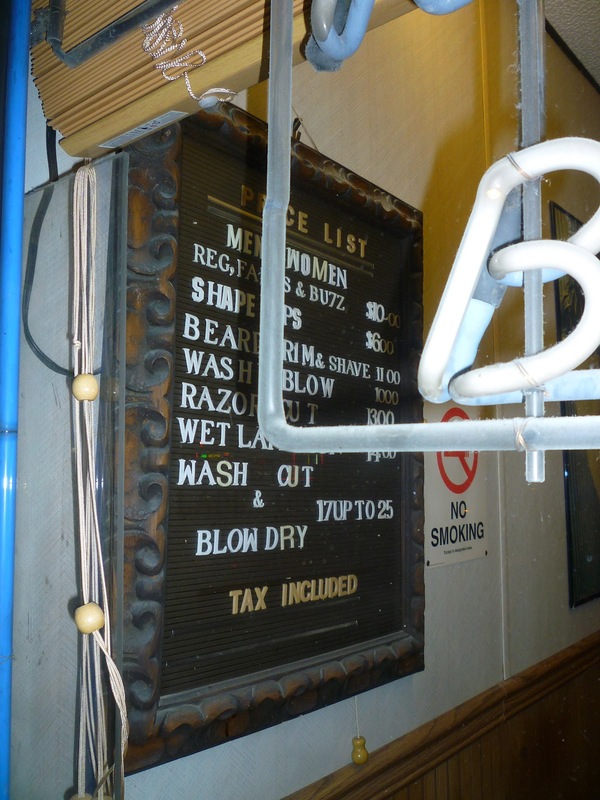 Bill's Gay Nineties closes on Saturday, March 24, possibly forever. The owners are talking about finding a new space, and they may. But regardless, it will never be the same. The bar has been in the same 1850s townhouse since opening during Prohibition. It's an irreplaceable setting for this diamond. I'm not certain that New Yorkers realize exactly what they're losing. Yes, a former speakeasy with peerless dark-wood atmosphere and decor and a world-class collection of old theatrical and boxing memorabilia. (The owners are taking all that with them, so the restaurant that moves in will look nothing like Bill's.) We all know that. An unmatchable Old New York atmosphere. That, too. And staff who have been doing the same job at the same place for anywhere from 10 to 60 years. Ditto. But Bill's has other hidden values, which will disappear come Sunday. Old places like this tend to, over the years, end up with pieces from other old places, ones that disappeared long ago. Take the swinging doors that lead into the basement bar. I've always admired them. 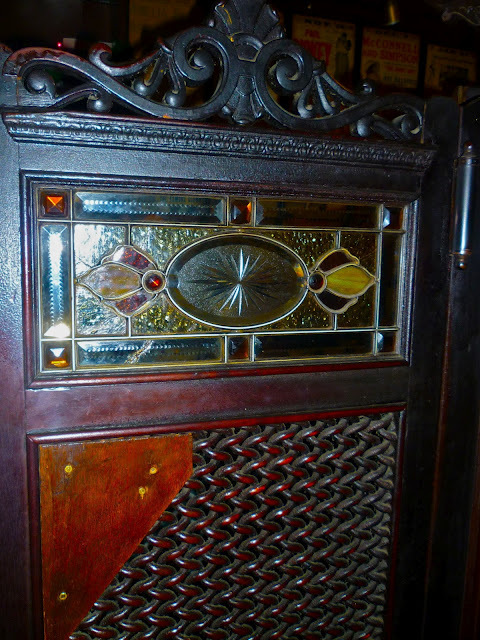 But they struck me as being too ornate and fine, even for a class joint like Bill's. They seemed more 1890s than 1920s. I was looking at this monolith, the Baruch College Academic Complex, on Lexington and 24th, the other day and thought I hated it. How obnoxiously out-of-context, I thought. No respect for the surrounding neighborhood. Why that mammoth sloping glass facade? Then I turned around and walked half a block and was reminded of the nearby presence of the old 69th Regiment Armory, built in 1906. The drill hall part of the building is a hunchback itself, isn't it? 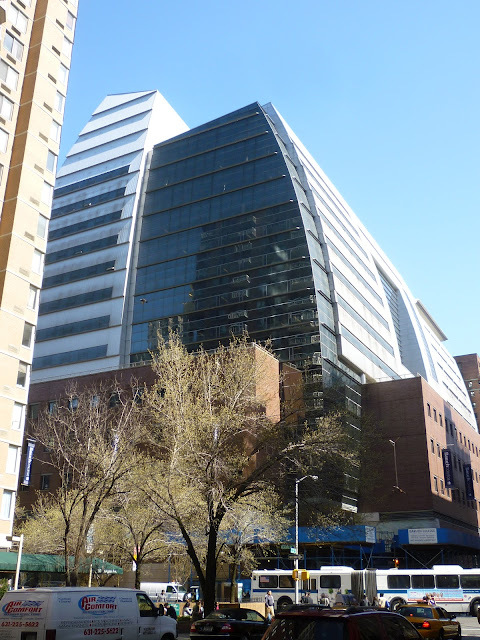 The Baruch building is almost a modern reflection of its shape. I'd like to think the architects of the newer structure, built in 2000, were thinking of their neighbor when they built it. But even if they weren't, it's a lovely juxtaposition. Can't remember if I've ever said so before. But the Old Town Bar has one of the best signs in the city. 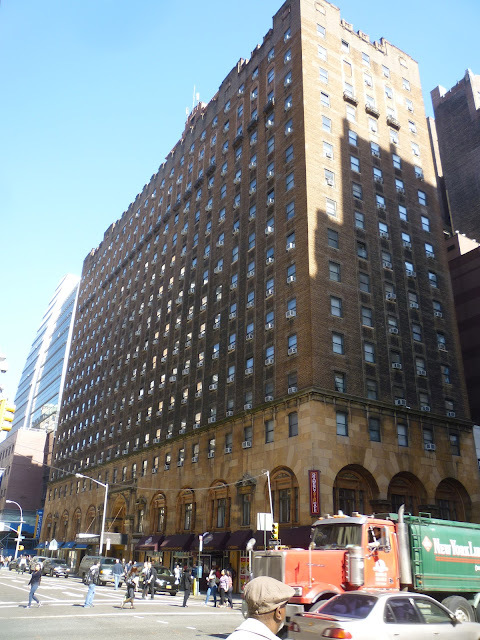 The George Washington Hotel on Lexington just above 23rd is now a residence hall for School of Visual Arts students. On the outside, it's easy to pass by. The building is a weird combination of the gorgeous and the seedy. The seedy is telegraphed mainly from the metal awning that hangs over the door (below). Only the holes for the words George Washington are there, no light behind. It gives the impression the building is derelict and might be an SRO. But look up to the second story and you see great expanses of beautiful, honey-colored brick, arranged by sunbursts around vaulted windows frames by pillars and decorative trimmings. Frank M. Andrews was the architect. Barber Shop. Shoes Repaired. Shine. 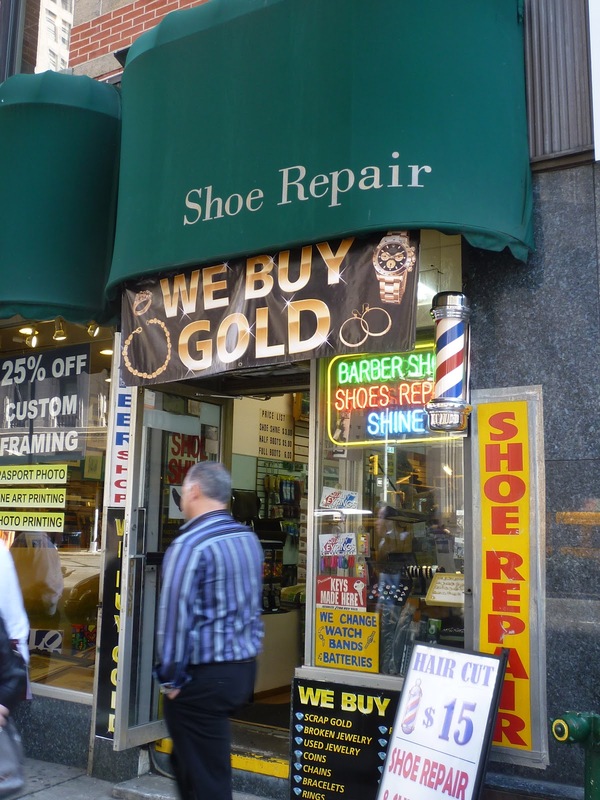 WE BUY GOLD. Weird mash-up nearly Gramercy. How much ya wanna bet that the owners don't have their heart in the shoe thing? 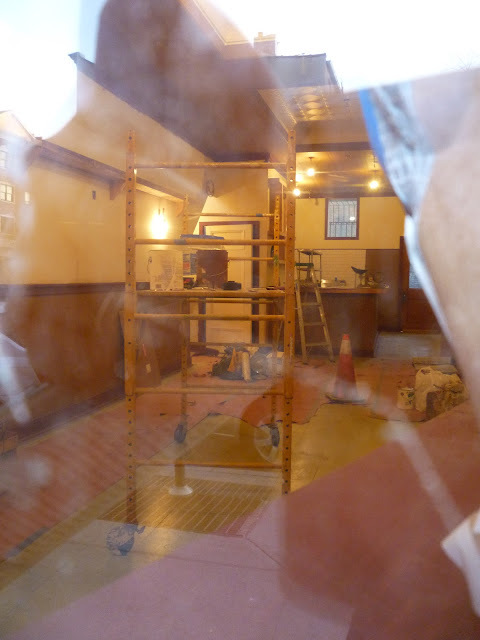 Inside, things are looking spiffier that the raffish old Fall Cafe ever did. I'll miss the place. It had pretensions, as all coffee bars do. But they were low-rent pretensions. 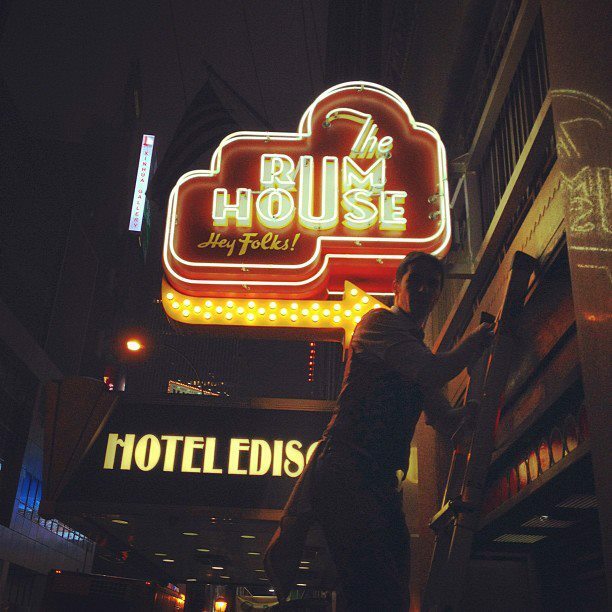 Some of us were concerned and dismayed when the wonderful old Times Square dive bar The Rum House, was chased out of its longtime space in the Edison Hotel in 2010. But the craft cocktail barmen who took over the space—they also own Ward III and other bars—were respectful inheritors of the location. They lovingly renovated the room and gave it a lovely post-WWII feel. The drinks are good and the live music is charmingly backward-looking. Now, the owners have done one better. They have hung a beautiful, retro neon sign outside their already popular bar. Again, it looks like something that might have brightened Times Square in 1945. Well done, gents. For reasons I do not understand, the intersection of 86th Street and Lexington has managed to fend off the plague of crappy, modern, anonymous Cemusa newsstands that have swept the city in the last three years, thanks to Bloomberg signing a contract with an urban architecture firm—in Spain. 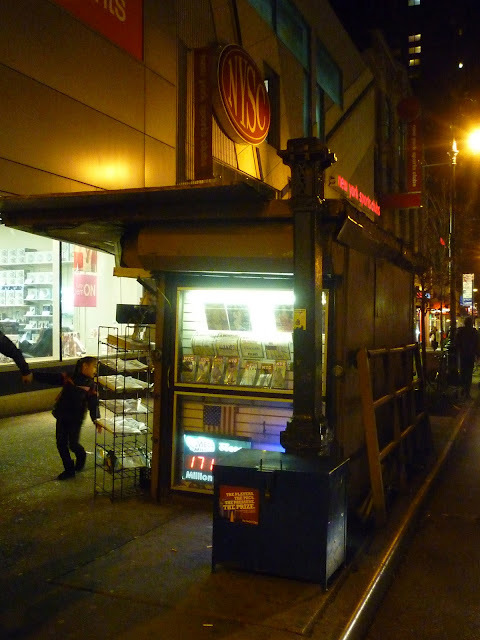 There are three newsstands at this crossroads, and each of them is gloriously old school. Messy, real, gritty and very New York. The rest of the intersection is awful—modern apartment and office towers and chain stores (Game Stop, Barnes & Noble, Best Buy, H & M) everywhere. (There used to be a wonderful little donut shop on the southeast corner which I still mourn.) But the newsstands almost save it. Of all the hot dog and papaya joints in town, I think Papaya King at 86th and Third has the more beautiful neon signage. The specificity of the language, and wackiness of the messages ("king of all drinks," indeed! ), puts it over the top. Sad to think the stand once had plenty of competition in terms of gaudy corner wattage. I love the set-up and the many open doors. Looking inside, I thought I saw Sidney Falco grabbing a quick dinner. 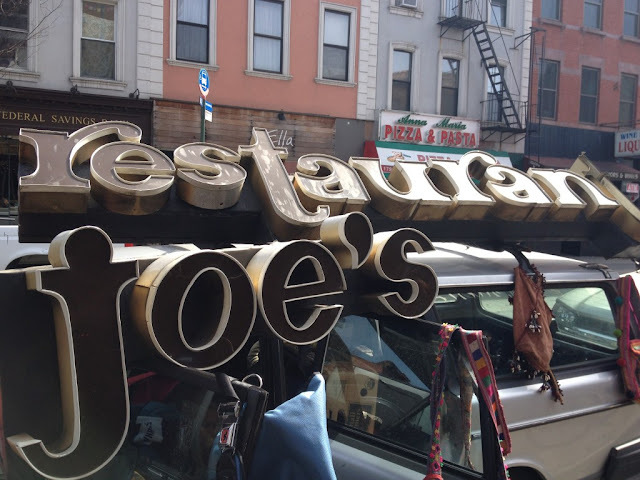 I was sorry to see Joe's Restaurant of Carroll Gardens close recently. The Court Street diner was no institution. It was not historical or particularly unique. But it reeked of local character. Old time Carroll Gardeners went there and gossips and caught up with one another. It was never gentrified or adopted by hipsters of youthful breeders. Probably because the old Italian-American folks inside gave off the unspoken but definite vibe that strangers weren't exactly welcome. Still, I liked it being there. Now Court Street is one step closer to being Everystreet. Anyway, Edible spotted the old sign this past weekend in Williamsburg. It was being sold by a surfer/scrapman. Wonder how much he was asking. I walked by the old Eagle Theatre in Jackson Heights, Queens, not two weeks ago. I looked forlornly upon the old building with its beautiful marquee, and reflected on how long it had been since it ceased business as the city's only Indian-language movie house. It closed in May 2009 and never reopened. The only comfort I could draw form the sight was that the marquee was still there, so there was a chance it would live as a cinema again. Today, a reader sent me this sorrowful picture of the marquee being destroyed. A huge piece of Jackson Height's cultural heritage is gone. I hear, however, that it will be replace by a South Asian market and food court. Which does not sound bad. And seems right for the area. Several Awesome Fonts for the Word "Superior"
Superior Sewing Machine has been on W. 25th Street in Manhattan since 1950. Since then, it has been illustrating its awesome grasp of font. Seriously, the company's storefront spells out the word "Superior" is several slightly different ways (they're all vaguely frilly and cursive)—and they are all great. A pleasure to look at. I don't know which "superior" I like best. Let's have a little history: "Superior Sewing Machine & Supply LLC is the leading wholesale distributor of industrial sewing and cutting machine replacement parts and supply items to dealers and import/export firms throughout the world." Well, that's something. The company was founded by Herbert Klapper, the son of a local New York second-hand sewing machine dealer (who thankfully didn't name the company after himself). Today, the company is the main distributor of Brother, Kansai, Mitsubishi, Racing, and Seiko parts. I was walking down 13th Avenue, the main shopping drag of Borough Park, and was shocked to find this gelato joint in the space held for decades by the bedrock glatt kosher Crown Deli. It apparently opened a year ago. Crown Deli has been an anchor business on the street. It was a classic Jewish deli, with all that entails, and did a big catering business. I often went there after visiting my wife's great-aunt, who lived on 13th Avenue. 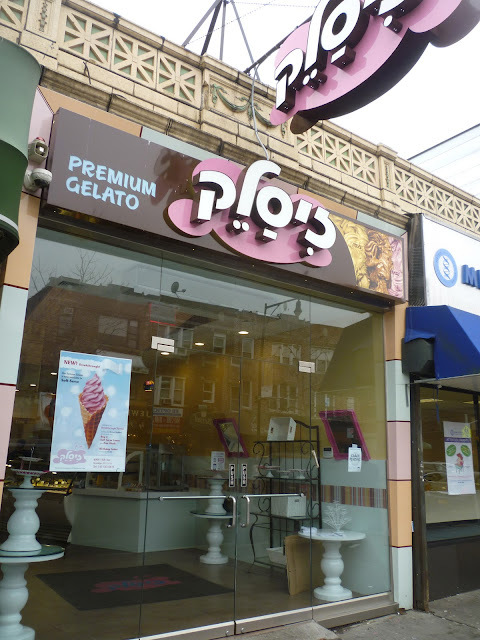 The Deli was one of many businesses owned by the wealthy Orthodox Jewish Rubashkin family. You may remember the name. The family ran into a heap a trouble a few years ago when Agriprocessors, the huge Kosher slaughterhouse and meat processing plant they owned in Postville, Iowa, was raided by U.S. government in 2008 for a host of violations. Among the charges: mistreatment of cattle, child labor violations and the use of hundreds of illegal immigrant workers. The company went into bankruptcy and was sold. I remember walking past Crown during those days and reading a sign in the window to the effect that that Rubashkin family was being persecuted. In 2010, Sholom Rubashkin, the former manager of the meat plant, was sentenced to 27 years in jail. 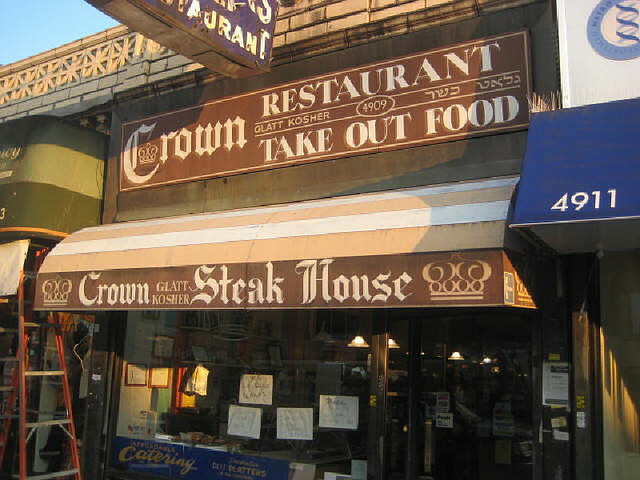 Crown Deli, at 4909 13th Avenue, was run by Rivka Rabashkin, wife of family patriarch Aaron. Founded in 1960, it had a reputation not as a going concern, but as a sort of soup kitchen, with Rivka feeding for free anybody who was hungry. But it was close several times for health violations in recent years. I can not discover what ultimately did the place in, but have to imagine it was the culmination of the family's many troubles. The place had a great neon sign, though it was old and never lit up. The metal support is still there, and now holds up the gelato sign. "S. Klein" appears in the tile before the door of 68 Clinton Street, now Falai, a falafel joint. This is perhaps the last scrap of evidence of the once mighty position Klein's department stores once held in the city. 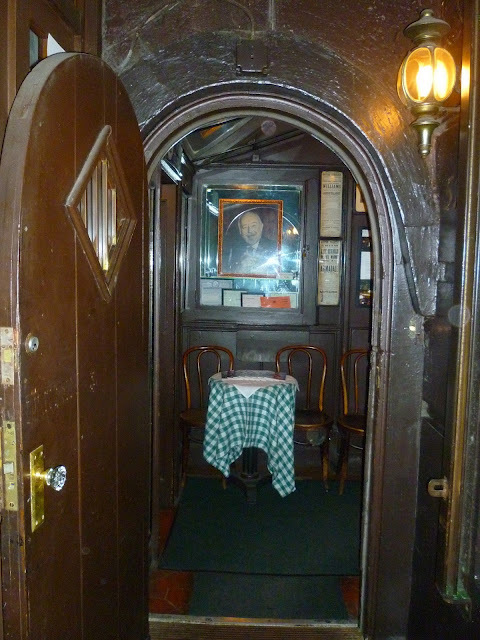 The local chain was founded by immigrant Sam Klein before World War I, in a small, second-floor space on Union Square. That location expanded greatly, and for many years, Klein's was famously associated with Union Square. It had a huge sign, two stories tall, that said, grandly, "S. Klein on The Square." The stores' stock and trade was discount good. Housewives knew you went to Klein's for bargains. The shop's logo was a carpenter's square, for some reason. Klein died in 1942. His family sold the business in 1946, and thereafter it passed through the hands of a few corporations. The Klein stores, of which there were once 19, continued to do well throughout the 1950s. By 1959, however, they began to register regular deficits. And price wars with Ohrbach's and J.W. Mays, two other discounters on Union Square, did the chain harm. The entire outfit shut down for good in 1975. The Clinton Street shop very likely closed some years before then. Klein's was immortalized in "Guys and Dolls," when Miss Adelaide sang "At Wanamaker's and Saks and Klein's/A lesson I've been taught/You can't get alterations/On a dress you haven't bought." I was upset last fall when two lovely, vest-pocket, side-street shops in Cobble Hill—an antique shop and an old dry cleaners—were pushed out at a moment's notice. If they had been replaced by a Dunkin' Donuts or Pinkberry, as I suspected they would be, I could have been hopping mad (as usual). 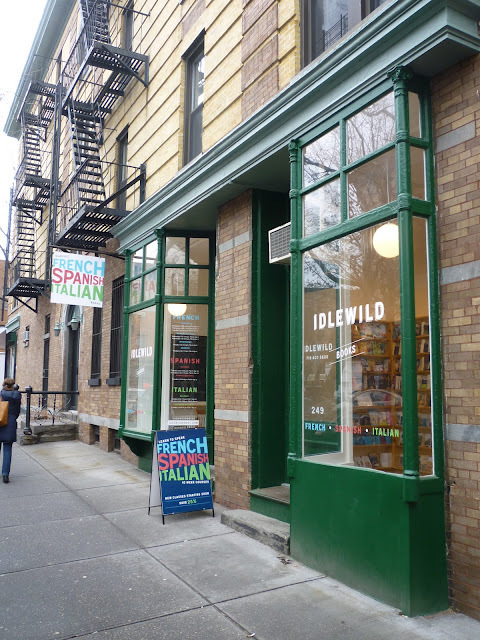 But instead they have been supplanted by Idlewild, a French-Spanish-Italian book store. They also teach those languages. How can you be angry about that? In Ridgewood, on Fresh Pond Road. Like the prices, too. 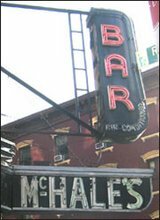 As first reported here on Feb. 10, Bill's Gay Nineties, the irreplaceable speakeasy-era bar on E. 54th Street, is closing. It is being pushed out by its landlord, Noel Tynan (who seems to live in Ireland, and therefore understands a great deal about the needs and desires of New Yorkers). Tynan reportedly refused to negotiate with Bill's owner, Barbara Bart Olmsted. The final day on Earth for Bill's will by March 24, confirmed the New York Times. *Greeter Aldo Leone, 88, is a close relative to the famed restaurateur Mama Leone! *A false brick wall in the basement still opens to a secret room where liquor was kept during Prohibition. The article said, "There has been talk that John DeLucie, a chef and owner of trendy restaurants like the Lion and Crown, may take over the spot, but details have not been confirmed." There have also been reports that Oldsted is going to take with her not only all the pictures on the walls, but the swinging bars and the bar itself. After they are gone, whatever DeLucie comes up with certainly won't bear any relationship to the old Bill's. Though I guess this happened last summer, I didn't seen it until this week: Zum Stammtisch, the wonderful old German restaurant in Glendale, Queens, has opened a pork store next door. 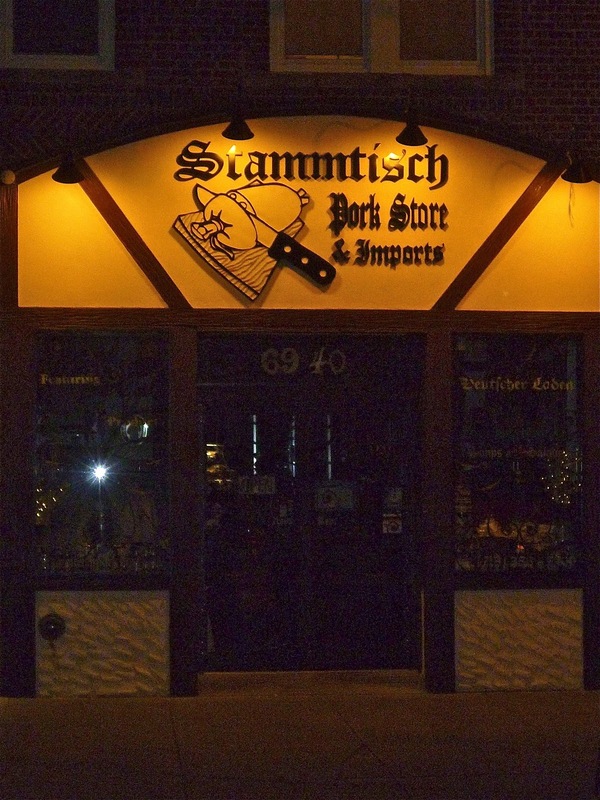 The butcher shop is located at 69-40 Myrtle Ave. is co-owned by Werner and Hans Lehner, who own Zum Stammtisch. The store offers a wide variety of quality meats, sausage, cheeses and products imported from Germany. On the less happy side, I strolled down a couple blocks to where Zum's competitor, Von Westernhagen's, used to stand to see what its replacement looked like. Edison Place looks clean and decent. But it also looks like a hundred other polished-wood-and-flatscreen upscale bar/eateries, the kind that are pretending to be posh and individual but are really just cookie cutter joints one step up from TGIF's. The interior layout is basically the same, except it doesn't feel like you're walking into someone's living room anymore. And the actual old time bathrooms have now been refashioned as "old time bathrooms." One could scream. Though they harken back in style and menu to the small-town drive-in diners of the 1950s, New York's string of Shake Shack would seem to be among the most 21st century of New York food institutions. The air of I'm-here-now, self-conscious cool—among the customers and the staff—is too thick. 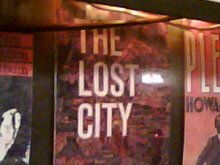 So I was surprised to find a little reminder of Olde New York inside the Times Square branch. I sat down with my Bird Dog and fries and saw this message burned into the long table: "Handcrafted in Brooklyn, NY, this surface was once part of a bowling late." No wonder the wood glows a bit. The tables are made by the DUMBO company CounterEvolution. There are apparently more bowling-lane tables in the Brooklyn restaurant. Where, I wonder, was the lane? What neighborhood?